In week 30 of the 5th grade spelling program, students will learn about sight words, suffix -ology, and academic vocabulary. The spelling list for this week is made up of the following twenty words: Jupiter, similar, daisy, convention, victory, stretched, experience, serious, allow, chronology, anthropology, sociology, psychology, theology, methodology, criminology, performance, rehearse, renaissance, and playwright. 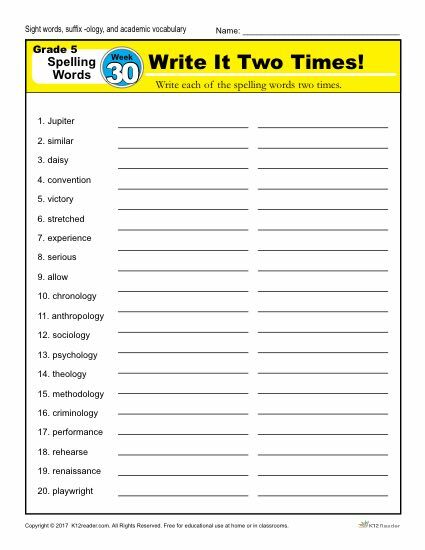 To master these words, students will practice their reading and writing skills with the five printable spelling worksheets that you can find below. Some of these spelling activities include: Write it Two Times, Dictation Sentences, Circle the Correct Spelling, Write a Sentence Part 1 and Write a Sentence Part 2. To view the 36 week 5th grade spelling words master list, click here.